I really love couponing because it helps us eat well and build food storage on a budget. Our food budget is $135/month and includes newspaper subscription (coupons), pet supplies, paper goods, and, of course, food. If you add in health & beauty products the budget is $155. This is for our family of 2, but since we are filling a store room on this budget, I don't imagine it will go up significantly with the addition of mini-Martineaus. 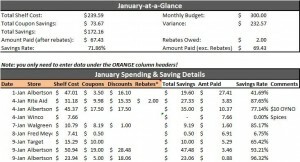 The Coupon Project has kindly made available a wonderful Savings Tracker for free! I do my grocery shopping on Mondays. When I get home I take the receipts and input all the information. Simple, and it is pretty neat to watch the savings. Ben appreciates how it keeps me honest about sticking to the budget! PS- I have a second copy of the file I use to track my mystery shopping. I change 'Shelf Cost' to 'Spent', "Coupons" to "Reimbursed", and 'Rebate' to 'Payment'. So far for January, we have gotten $129 worth of free food and entertainment, and we have made $70. These amounts are a little higher than normal. So far in January we've been able to sign up for some great shops- a Fun Zone ($75), Cheesecake Factory ($40), Dollar Theater ($12) and several fast food assignments. Read other posts on: mystery shopping. I just found your blog through Lucy's bloghop, and now I follow. I can use some help from a coupon pro. I'm one of those good intentions, no follow through coupon people. You need to school me on this whole couponing thing! Here returning your FMBT follow, by the way! Ok, I need this! I found out today that I have $5 left to spend for the whole rest of January because I have already spent our food budget!! I am so going to use this next month if I can figure it out. Bless you posting and sharing. I'm a new follower from the Give It To Me Monday Blog Hop. If you get a minute please stop by and follow me back.